A fun, delicious dish that makes the most of pricey wild King salmon. One of the true great pleasures of summer is indulging in local King salmon. Rich, oily, luscious and deep pinkish-red in color, it’s my favorite fish. When an assignment took me to Half Moon Bay, I tossed a cooler in the back of my car in hopes of scoring some fresh catch to take home. I stopped in at Princeton Seafood Company, intent on buying a few fillets. But I walked out with an entire California King salmon instead. At first, the $150 or so total price tag for the nearly 8-pound fish made me gulp. But when you consider that local wild salmon fillets sell for upwards of $28 a pound there and at farmers markets, paying $19 per pound for the entire fish really made more sense, especially if you can’t get enough of salmon like me. At Princeton Seafood, the friendly fish monger will scale the fish and cut it up however you like. 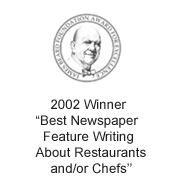 I asked for fillets, skin-on, and for all the bones, too. After all, crispy salmon skin is a true treat to nibble on. I know some people can’t be bothered with the bones, but trust me, they are a trove of meat. Indeed, if you take a fork and scrape off the flesh still clinging to the bones, you will be amazed at how much you will end up with. Make your own poke or tartare out of those scrapings by drizzling it with soy sauce and lemon, then mound it over some steamed white rice. 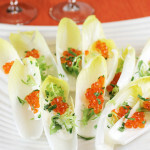 Diced cucumber, green onions, fresh shiso leaves, toasted sesame seeds, avocado or slivers of nori make ideal garnishes. You could even add some wasabi or kimchi. From a fish this size, you’ll end up with enough scrapings to serve two for dinner, and some leftover to fold into scrambled eggs the next morning. Ask the fish monger to split the salmon head for you. 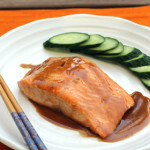 Then grill or broil that with the salmon collar sprinkled with a little salt or rubbed with a little miso paste. Take your chopsticks to the pieces to dig out all the lovely bits of flesh, and enjoy again with steamed rice, and some stir-fried veggies. 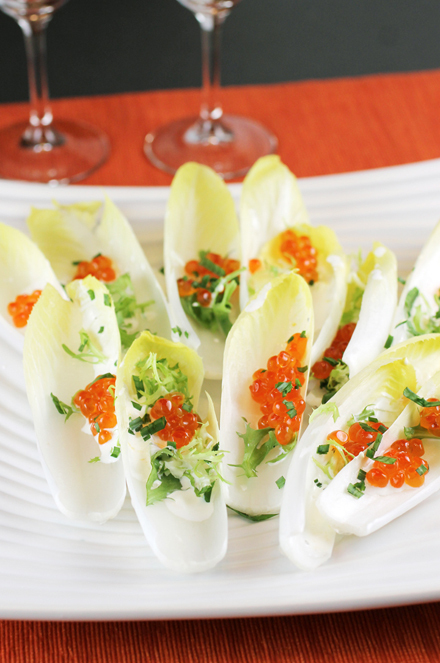 Most importantly, don’t forget to pry out the prized cheeks — the silkiest morsels of any fish. Lastly, portion the fillets, wrap well, and freeze to enjoy in the weeks or months to come. All in all, I ended up with nearly 16 servings from that one fish, which came out to less than $10 per serving. What a deal for wild, local salmon, right? Not to mention, I buried the salmon bones in my backyard pots before adding my tomato plants in to give them extra nourishment. 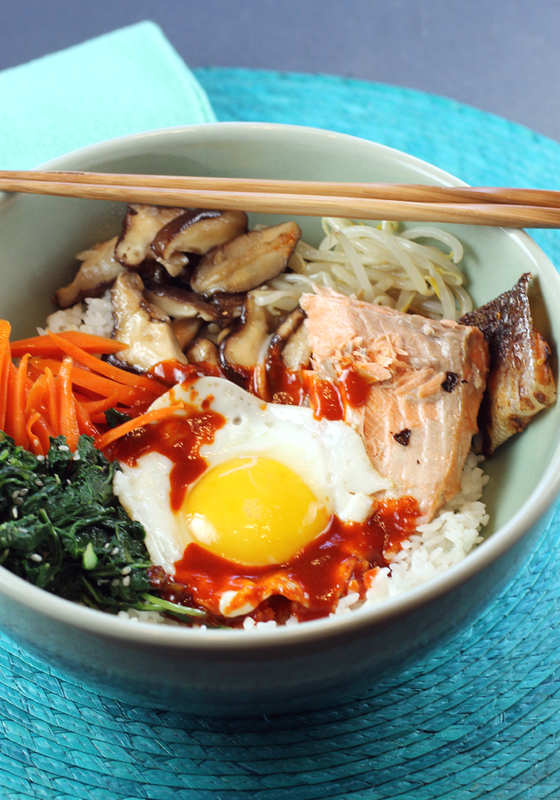 “Broiled Sesame Salmon Bibimbap” is another way to make pricey salmon go a long way. 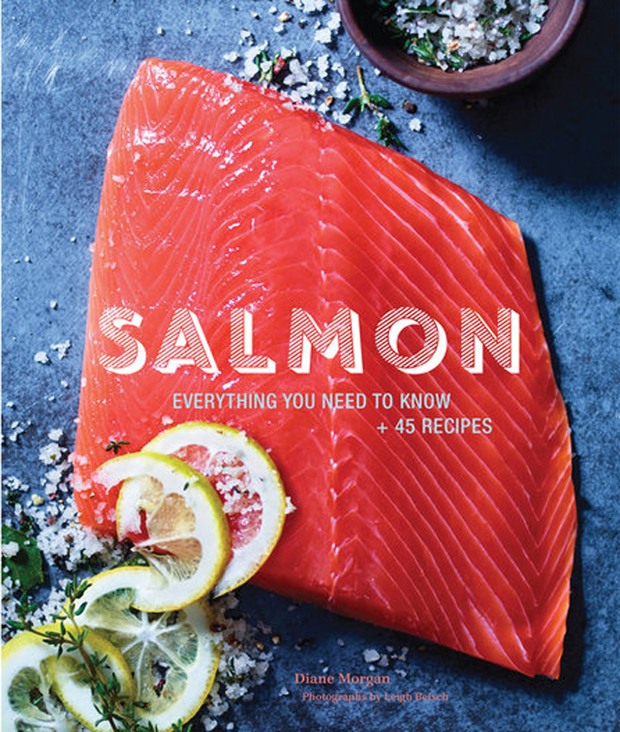 It’s from the new cookbook, “Salmon: Everything You Need To Know + 45 Recipes” (Chronicle Books), of which I received a review copy. 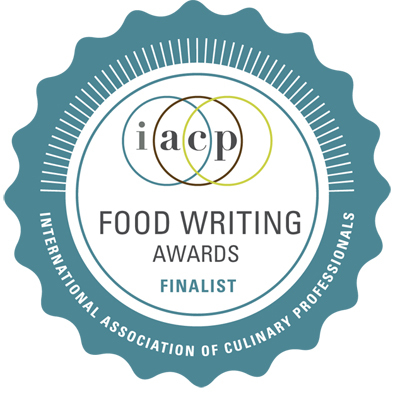 It’s by veteran cookbook author and culinary instructor Diane Morgan of Portland, OR. 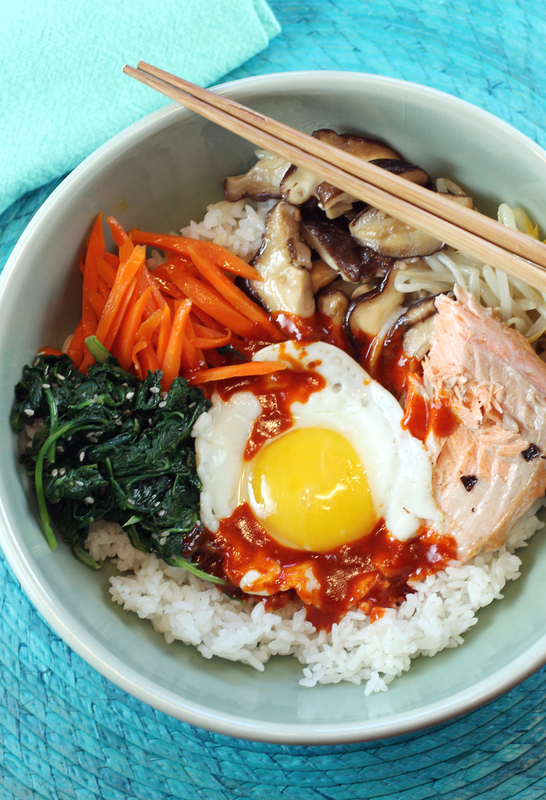 Korean bibimbap is the ultimate bowl food. A mound of rice gets arrayed with various vegetables, a protein, a fried egg, and a spicy sauce. This recipe calls for a 12-ounce fillet of salmon to be divided among four bowls. 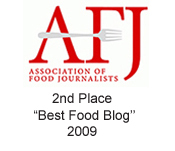 At first you might think that a meager 4 ounces of salmon per person might not be nearly enough to satiate. But with the rice and the veggies, especially the meaty shiitake mushrooms, it’s actually quite filling. The recipe does call for chopping and prepping quite a lot of vegetables. But don’t let that put you off. It’s really not much more work than making a typical stir-fry. You can vary the vegetables used or even add more of them, if you like. The sauce is a blend of Korean fermented chile bean sauce, gochujang, plus sugar, sesame oil, rice vinegar, and a little water to thin it. It’s gently tangy, peppery, sweet and spicy. Drizzle as much as you like over the rice, salmon, fried egg and piles of shiitakes, bean sprouts, spinach, and carrots. Then, dig in, mixing everything up, or just picking up various bits here and there with your fork or chopsticks. Every bite will be a little bit different, which is part of the fun of bibimbap. It will show you just how much you can stretch a modest amount of salmon, too. So much so that when another assignment took me to Half Moon Bay again last week, I stopped into Princeton Seafood to buy another whole King salmon. On the drive home, I couldn’t help but salivate over the many meals to come. Don’t forget to tuck in a bit of lovely crisp salmon skin (to right of salmon fillet). Yum! To prepare the salmon: Place the fillet in a nonreactive pan just large enough to hold it. In a small bowl, combine the soy sauce, vinegar, mirin, ginger, sesame seeds, and pepper and mix well. Pour the marinade over the salmon, then turn the salmon to coat all sides. (Alternatively, place the salmon in a freezer-strength lock-top plastic bag, pour in the marinade, press to remove any air from the bag, and seal tightly. Turn the bag to coat the salmon on all sides with the marinade.) 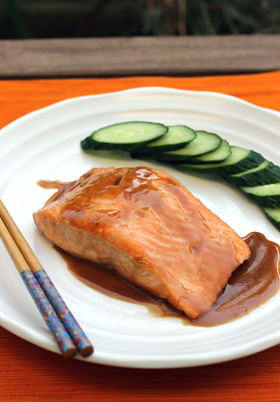 Marinate the salmon at room temperature for at least 30 minutes but no more than 1 hour. Meanwhile, prepare the vegetables: Fill a large saucepan two-thirds full of water and bring to a boil over high heat. Add 1 teaspoon salt and then add the bean sprouts and cook for 1 minute. Using a slotted spoon, transfer the sprouts to a colander to drain. Blot the sprouts with paper towels and transfer to a small bowl. Add the spinach to the same boiling water and cook just until bright green and wilted, about 1 minute. Drain the spinach in the colander and place under cold running water to stop the cooking. Shake off the excess water. When the spinach is cool, squeeze out the excess liquid and transfer the spinach to a medium bowl. Toss the sprouts with 1/2 teaspoon of soy sauce and 1/4 teaspoon of sesame oil. Set aside. Toss the spinach with 1 teaspoon of the soy sauce., 1/4 teaspoon of sesame oil, and the sesame seeds. Set aside. In a wok or a large, deep frying pan, heat 2 teaspoons of the grapeseed oil over high heat and swirl to coat the bottom and sides of the pan. Add the mushrooms and stir-fry for 1 minute. Add 2 teaspoons of the mirin, 1/4 teaspoon of sesame oil, and the remaining 1/2 teaspoon soy sauce. Stir-fry until the mushrooms are browned and softened, about 2 minutes longer. Transfer to a plate. Add the remaining 2 teaspoons grapeseed oil to the pan over high heat and swirl to coat the bottom and sides of the pan. Add the carrots and stir-fry for 2 minutes. Add a pinch of salt and remaining 2 teaspoons mirin and 1/4 teaspoon sesame oil. Stir-fry until crisp-tender, about 1 minute longer. Transfer to a plate and set aside. To make the sauce: In a small bowl, combine the gochujang, water, sugar, sesame oil, and vinegar, and mix well. Set aside until ready to use. Position an oven rack 3 to 4 inches from the heat source and preheat the broiler. Line a rimmed baking sheet with aluminum foil. Remove the salmon from the marinade, wiping off any excess. Place the salmon, skin-side down, on the prepared baking sheet. Remove the salmon from the broiler. Lift off the skin and discard it or chop some of the crispy pieces and reserve for garnishing the bowls. Cut the salmon into four equal portions. Divide the rice evenly among warmed bowls. Top each serving of rice with a portion of salmon, arranging it to one side of the bowl. Arrange the vegetables — bean sprouts, spinach, mushrooms, carrots — in individual mounds around the sides of the bowl. Slip in a wok-fried egg, if desired. Spoon some of the sauce onto the center of each bowl and garnish with some crisp salmon skin, if you like. Serve immediately. Wild salmon is wonderful, isn’t it? Love it at this time of the year! Although it does freeze well. You got a deal with that fish, although the price tag would have put me off too. Great dish, too — salmon is so rich in flavor a little goes a long way. Thanks! people tell me that if i’m going to try to ease into liking seafood, salmon is a pretty good option. i’m still not convinced, though this does look good! Judith: Holy moly, I am so envious! Talk about a deal — on housing AND on salmon. Lucky you!